"For just as the body is one and has many members, and all the members of the body, though many, are one body, so it is with Christ...Now you are the body of Christ and individually members of it." We’re once again gearing up for another amazing summer camp season for 2016, and we’re excited to invite you and your family to join us! Our theme this year is “Unique; United”, based on the idea that we ALL are the many members of the One Body of Christ. 1 Corinthians 12: 12 reminds us that “For just as the body is one and has many members, and all the members of the body, though many, are one body, so it is with Christ.” We are all important members of this family of believers, with unique abilities and gifts to help unite us as one body in Christ. This summer we hope to help your camper discover just what makes him/her unique and amazing, and in turn encourage them to use those qualities to build one another up in the one true faith! Click on the link above to download and read the summer brochure! We’ve done our research and have decided to try a new tiered pricing structure this summer. This new format give us the opportunity to offer different prices to our customers which strive to find a balance between our actual costs and what you feel your family can afford. The first tier most accurately reflects the actual cost of providing camp ministry, whereas the second and third tiers are prices we can offer due to fundraising with partner congregations and generous donor gifts. If you have any questions at all regarding this new system, please don’t hesitate to call or email us directly, we’re happy to help. For now, all you need to do is select the payment tier that best fits your family’s financial situation when registering, all other elements of the registration process stay the same. Thanks! All of our 2016 summer camps are listed below for your easy perusal, with dates and costs included. If you have any questions about details surrounding any of these offerings, please call us at 402-352-5655. There IS an early bird discount of $20 for registrations received before April 15th that are PAID IN FULL, but this does NOT apply for Family Camp events. There is a deposit of $50 required with registration to hold your camper's spot, and full payment is appreciated no later than two weeks before your camp's start date. To register, please print and return the registration and health form below. If you wish to register online, we hope to have that available by March 1st. Our Explorer camps are geared especially towards our younger campers, entering grades 1-4. These camps are a shorter experience than our full week, but offer the same great activities and opportunities for fun and fellowship! The Explorer schedule is structured for a safe, enjoyable introduction to camp, which includes daily time for swimming, canoeing, hiking, singing, and growing their faith through Christ-centered worship, devotions and Bile Studies. Each camper will also get the chance to choose their own activities, such as archery, sports courts, and crafts! If you're heading in to Grades 4-6, you'll be a Discovery camper this year! If you're hitting junior high, grades 7-9 are our Adventure campers! This full week experience for our older campers is geared towards deeper faith growth, building their identity in Christ, and understanding the life applications of scripture. 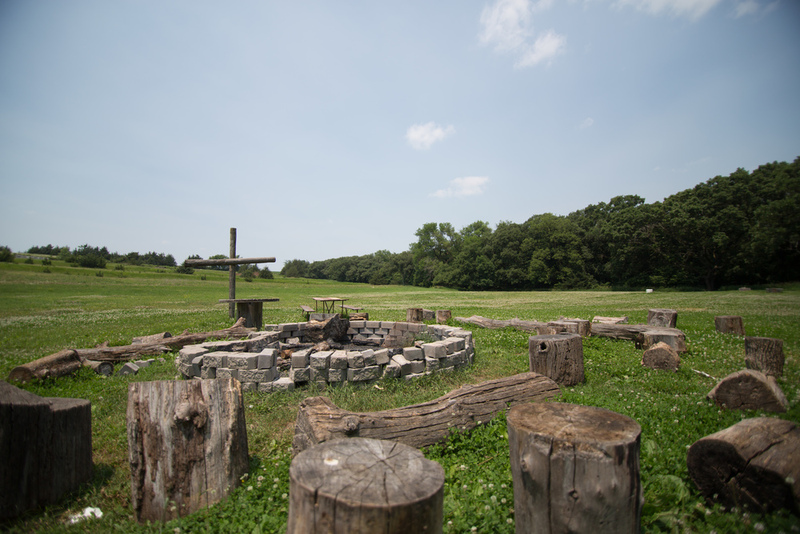 Each camper will have the chance to engage in our great camp activities, including waterfront, outdoor sports courts, evening group games, hiking, archery, crafts, and Christ-centered chapel time, Bible studies and campfires! Come join us for the opportunity to build lasting friendships and life-long faith, all while experiencing God's great outdoors! SPECIALTY CAMPS! For campers entering Grades 4-9 only please! Looking for something than our regular, full-week offerings? Our specialty camp offerings should be the perfect way for you to tailor you camp experience to fit your own interests! Campers will still have time to enjoy all of our other fun-filled camp activities and faith building opportunities in addition to their specialty camp sessions. This year we have Survival Camp, AMP Camp, Sporting Goods Camp, and STEM Camp. Survival camp is for those looking for an adventure in the wilderness, cooking and sleeping in God's great outdoors! AMP camp is our Arts, Music and Performance week, dedicated to those who want to engage in artistic pursuits while at camp, including sessions in fine art mediums, improv/drama, and music performance. Our Sporting Goods camp is perfect for those young athletes looking for a chance to learn new skills or refine them in several different areas all while learning what it means to be a Christian athlete in today's world. And lastly, we're introducing the STEM camp. Science, Technology, Engineering and Mathematics all come together this week as your camper can explore different topics, projects and experiments alongside others their age who enjoy the same subjects! This is the opportunity for our youngest campers to experience Camp Luther alongside a love one. Come for the day, or stay overnight! Build lastings memories while enjoying your choice of classic camp activities and fellowship around a crackling campfire. Share your faith and your time with your little campers in God's great outdoors. We do recommend that children be at least 4 years old to participate. Please register EACH PARTICIPANT separately, listing your family members as your "cabin mates" on your registration form. ONLINE REGISTRATION OPEN NOW!! Click here to Register TODAY! Or, you may download the registration and health form below and mail in with your deposit or full payment. If you are in need of financial aid and assistance, we recommend checking with your local congregation, church organizations and/or auxiliary groups. If your need persists, please print off the Campership Application below and mail back to Camp Luther ASAP. Now you've registered for camp, what should you bring? Great question! Here's a list for you to print out! Registration/check in is from 4-5PM on the first day of your child's camp. (Unless you are registered for a family camp event, in which case the time is Saturday 9-10AM) Please check in at Gerwick Lodge, the large brown building at the top of the hill. From there you will find out where your child is staying and move them into their cabin. Please remember to bring a completed health form with you if you registered online. Pick up is at NOON on the last day of your child's camp, with a family meal followed by a closing program. Family camp weekend ends at 10AM on Sunday morning. Grandparent/child camp runs 9AM-4PM on Saturday, July 16th.